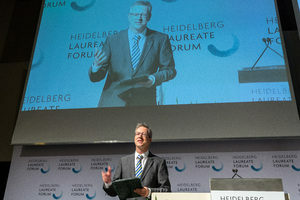 Günter M. Ziegler, a professor of discrete geometry at the Free University of Berlin, served as the master of ceremony for the opening of the fourth Heidelberg Laureate Forum. Credit: © Heidelberg Laureate Forum Foundation / Flemming – 2016. Used with permission. HEIDELBERG — For an aspiring mathematician or computer scientist, Heidelberg is the place to be in September. That’s when the Heidelberg Laureate Forum takes place. The 2016 forum gave 200 young researchers from 55 countries the chance to meet with over 20 winners of the most prestigious awards in mathematics and computer science: the Abel Prize, the Fields Medal and the A.M. Turing Award. Schmidt shared the 2011 Nobel Prize in physics with Adam Riess and Saul Perlmutter for their discovery that the expansion of the universe is accelerating. The cause is thought to be ‘dark energy,’ which constitutes about three-quarters of the universe. In responding to a question about his team’s discovery, Schmidt said that the data “seemed too crazy to be right. We were a little scared. I actually got this sinking feeling in my stomach thinking I had just spent three years of my life making a giant mistake.” Dark energy, Schmidt noted, is among the biggest mysteries in cosmology, along with questions about dark matter, neutrino mass and cosmic inflation. A ‘hot topic’ session raised open questions about artificial intelligence (AI). The panel of experts included Google vice president Vinton Cerf (whose business card says Chief Internet Evangelist); Holger Schwenk, research scientist at Facebook Artificial Intelligence Research Paris; and Noel Sharkey, a co-founder of the Foundation for Responsible Robotics. They offered reassurance to the audience that they did not lose sleep fearing that AI will lead to the end of humanity, as Stephen Hawking and Elon Musk have said and Skynet has done (in the Terminator movies). 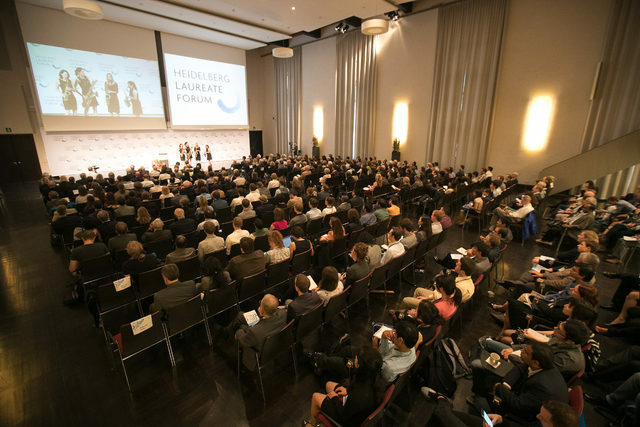 From the opening ceremony of the Heidelberg Laureate Forum. Credit: © Heidelberg Laureate Forum Foundation / Kreutzer – 2016. Used with permission. The forum drew attendees from a variety of backgrounds. One of them was Waqar Ali from Pakistan, who is pursuing a master’s degree in pure mathematics at Trinity College in Cambridge, U.K. The global representation at the forum gave him hope, he said: “There are people from different nationalities here, many of whom belong to countries that are not at the forefront of mathematical and scientific research.” Ali thinks there are more opportunities for young intellectual minds these days, noting that his participation in the Mathematical Olympiads at an early age was a factor in his decision to pursue a career in mathematics. “The organizers of the forum did a great job of getting underrepresented researchers” from developing countries, said Barbara Liskov, a professor of electrical engineering and computer science at the Massachusetts Institute of Technology. One of only three women to have won the Turing Award, Liskov noted that there is plenty of room for additional outreach. “If you look at most high-tech companies and universities, there is still only a small percentage of women and underrepresented minorities” in math and computer science, she said. According to a survey report (pdf) by the American Mathematical Society, women hold only 15 percent of tenure-track positions in mathematics in the U.S.
At the close of the meeting, Beate Spiegel, chair of the Heidelberg Laureate Forum Foundation and managing director of the Klaus Tschira Foundation, reiterated the commitment of the forum foundation and its partners to these high-level events. “The forum will be continued as long as the open, unfettered scientific exchange between laureates and young researchers is a useful means for advancing science — which we are convinced will be the case for a long time,” she said. Undergraduates, doctoral candidates and postdocs may apply to attend the next forum, to be held September 24-29, 2017. The deadline is February 14, 2017. The forum FAQ is here.